Battlefield 1 Warbonds are your keys to better weapons, so here’s how to earn them fast. This guide will show you how to efficiently earn more Warbonds in Battlefield 1. One of the many changes to the Battlefield franchise is the addition of Warbonds, an in-game currency that is used to purchase weapons for multiplayer. However, it can be difficult to not only choose what weapon to buy, but also to earn Warbonds in the first place. 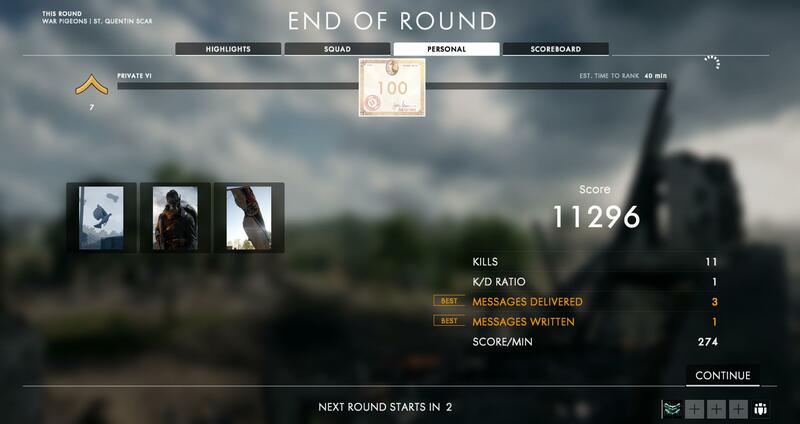 Warbonds in Battlefield 1 are awarded every time you level up your Soldier rank. Each new Soldier ranking requires an even greater amount of experience in order to hit the next level, so it becomes increasingly difficult to hit each milestone. In order to earn more Warbonds, you will need to rank up quickly. Part of the solution to this is to play more efficiently during a game, learning how to play multiplayer better. You should constantly be looking for ways to increase the amount of points you earn per game as these are directly related to your end-game experience. Another way to speed up the process is to complete the Weekly Medal missions. Each of these Medal missions rewards a large amount of experience that will go directly toward your next rank in Battlefield 1. As you rank up, the amount of Warbonds you earn per level will increase. At rank 7, which is Private 6, I earned 100 Warbonds which is enough to purchase a new Gadget or Grenade. Even though you might be earning more Warbonds with each level, it’s still a good idea to accrue a stockpile of Warbonds before making an educated purchase. Warbonds can only be used during a match or through Battlefield’s website. Unfortunately, at this present time, you are unable to make purchases through the main menu. Hopefully this will be changed in the future. 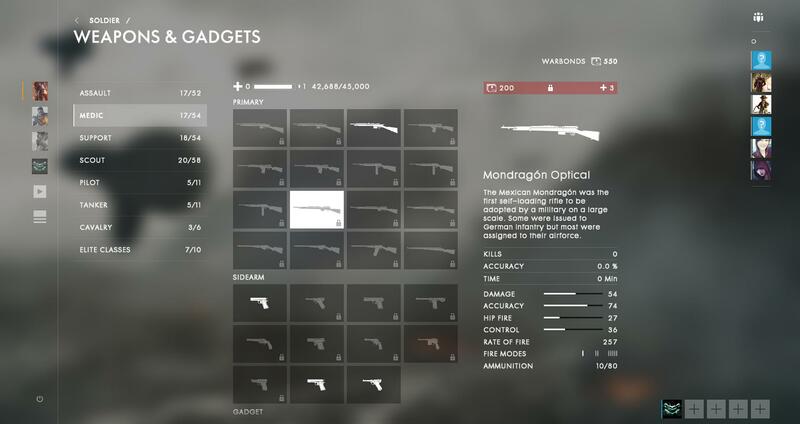 Once the Battlefield 1 match begins, select “Customize” at the bottom of the screen, then the Class, and then select the weapon you wish to purchase. There are some limitations to what you can purchase. Firstly, you can only purchase a weapon you have unlocked and weapons only unlock when you level up a Class. 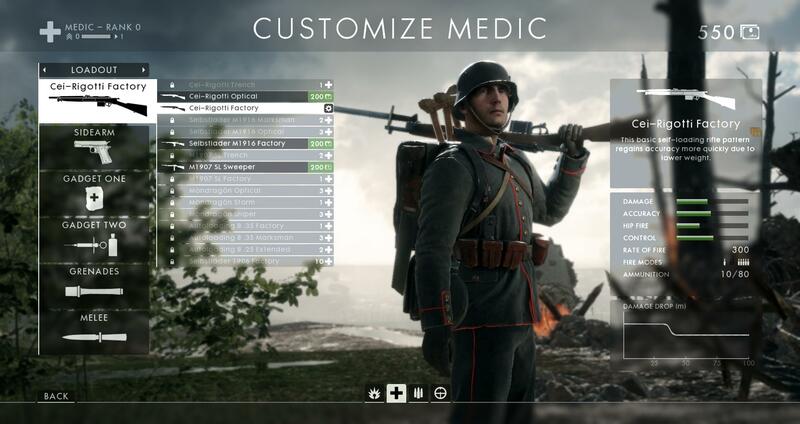 Leveling up a Class in Battlefield 1 is different to leveling up your Soldier ranking in that you must use a Class for it to accrue experience. For instance, your Scout Class will not earn experience while you are playing the Medic Class. Once you reach the first level in a Class a few weapons will become available for you to purchase using Warbonds. 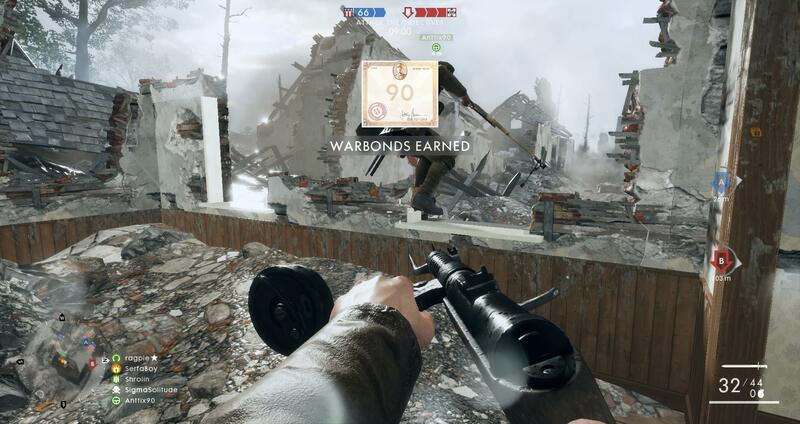 In Battlefield 1, you can use Warbonds to purchase Primary weapons for 200 Warbonds each, Sidearms for 150 Warbonds, Melee weapons for 150, and Gadgets and Grenades for 60 Warbonds each. A good idea is to save your Warbonds until one of your Classes reaches the first rank. Doing this will ensure you have enough experience in a Class to decide whether or not you want to invest your very limited quantity of Warbonds in that Class’ weapons. The worst thing would be to spend Warbonds on a Class you don’t enjoy and then feeling like you must spend your time in Battlefield 1 playing that Class. That’s everything you need to know about how to earn more Warbonds in Battlefield 1. It’s an easy process with not a lot of tricks other than improving your skills and ensuring you complete the Medal missions. Be sure to take the time to really understand the Battlefield 1 Classes before you spend a lot of your hard earned Warbonds unlocking weapons.